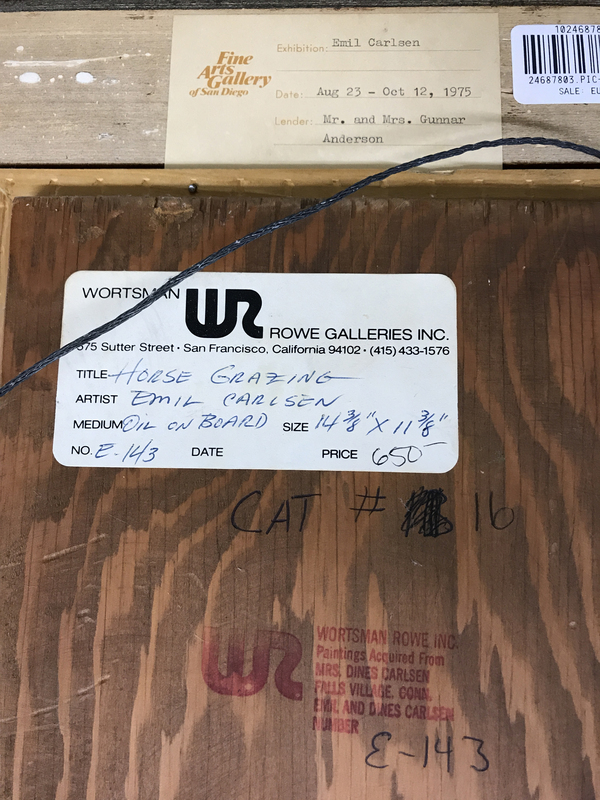 1975: Horse grazing [from exhibition catalog and verso label]. Location: Upper middle wood frame verso. Text: ‘10246878038[?]8[?]8[?]9[?]8[?]9[?]5[?] [unclear from photo last several numbers] / [UPC tracking bar code] / 24687803.PIC / SALE – [unclear from image last word]’. 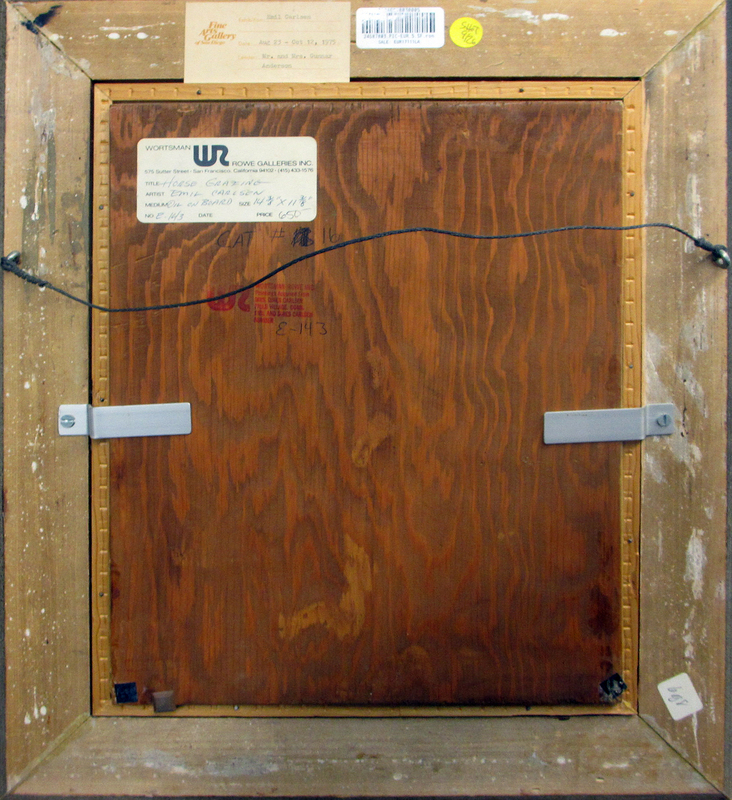 Location: Upper middle-right wood frame verso. Text: ‘WORTSMAN / WR [stylized logo] / ROWE GALLERIES INC. / 575 Sutter Street · San Francisco, California 94102 · (415) 433-1576 / TITLE [printed] HORSE GRAZING [handwritten] / ARTIST [printed] EMIL CARLSEN [handwritten] / MEDIUM [printed] OIL ON BOARD [handwritten] SIZE [printed] 14-3/8″ x 11-3/8″ [handwritten] / NO. [printed] E – 143 [handwritten] DATE [printed] PRICE [printed] 650 — [handwritten]’. Text: ‘CAT # [scribbled out number 13] 16’. Text: ‘WR [stylized letters/insignia left of the entire block of text] / WORTSMAN ROWE INC. / Paintings Acquired From / MRS. DINES CARLSEN / FALLS VILLAGE, CONN. / EMIL AND DINES CARLSEN / NUMBER / E – 143 [handwritten]’. Marking type: Vertical rectangular white label with handwritting in pencil? hung angled leaning left. Location: Lower right wood frame verso. 2017 Bonhams [1793- ], San Francisco, CA, “The elegant home : select furniture, silver, decorative and fine arts”, November 13. – Bonhams [1793- ], San Francisco, CA, “The elegant home : select furniture, silver, decorative and fine arts”, November 13, 2017, lot #332, illustrated: color on online catalog. – Rubicon-Wortsman Pub., San Francisco, CA, exhibition catalog, ”The art of Emil Carlsen 1853-1932”, 1975, #16, Illustrated: b&w. – Evening light, 1930 [similar palette, subject and technique].